If you have not already visited Observing Lent and Celebrating Easter in 2016, go there now to get the long view of the season with children. On the first Sunday in Lent remember that many children (and probably many adults) will not have been at Ash Wednesday services, so will need an introduction to the new season. Change the paraments to purple together as worship begins or note the changes from last week. 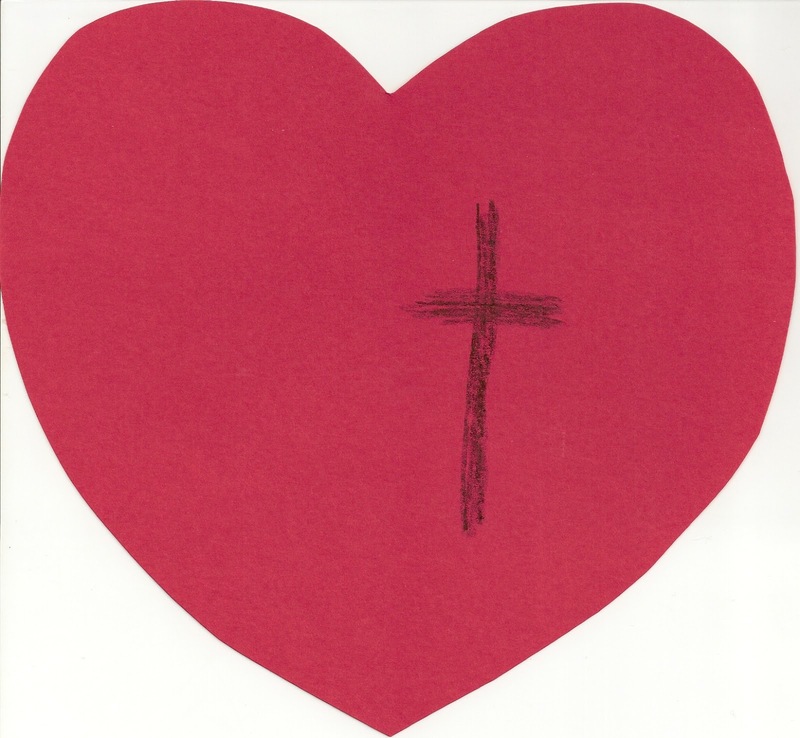 Give out Lenten resources to use at home. And, bury the Alleluia. For this year, there are two strong themes that work through all the Sundays of Lent. Sacrificial love is a theme found in many of the stories and there is a connection to the one of the phrases of the Lord’s Prayer each Sunday. You will also find more hymn suggestions than usual as fodder for a “singing your way through Lent” theme. w The Love theme in the texts is magnified by the fact that the first Sunday of Lent falls on Valentine’s Day this year. That makes this an opportunity to explore the fact that loving is more than cards, candy, and flowers. Those are all nice. But loving means with sticking with each other – even when it not easy or pleasant. Jesus shows how it is done most fully. w Feature large red valentine hearts with a black cross drawn on each one. Another way to talk it through: Start with the plain red paper heart. Talk about what we mean when we say “I love you.” Include such meanings as “I think you are pretty/handsome/cool/neat,” “I want to be your friend,” “I am glad I know you,” “I am glad you are my teacher/coach/sister”…. Note that it feels great to get and give valentines. Then, talk about what happens as you try to hang on to that valentine love day after day. Imagine what it would take to hold on to that love if the person you gave it to got sick or broke a bone and needed LOTS of help. Ponder what it takes to hold on to the love when the person you share it with says or does something mean or hurts your feelings. Finally, draw a large black cross on the heart. Note that real love is not easy. Introduce Lent as a season in which we try to love better. Point to some opportunities for families to work on loving and ways your congregation will explore loving in worship during Lent. 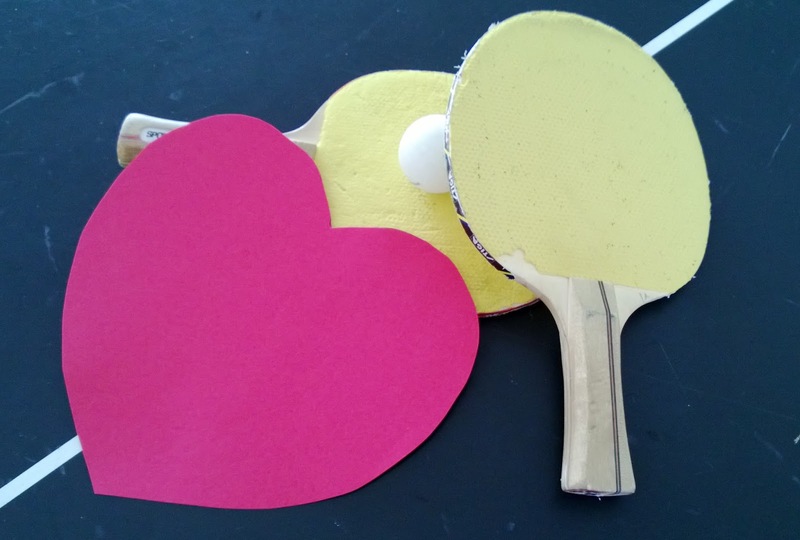 Some people even give their hearts to ping pong. To tie the heart directly to the temptation stories today, present a red heart and briefly talk about deciding who we give our hearts to on Valentine’s Day. Then, note that we sometimes give our hearts to things as well as to people. Display a soccer ball and put the heart on it. Talk about what we mean if we say we give our heart to soccer. Repeat the process with several other items – maybe a musical instrument, a soft fuzzy sweater or pair of cool shoes (giving our hearts to clothes), even a pizza box (loving only certain foods and wanting them all the time), etc. Note that in this story, Jesus is deciding to what he will give his heart. He decides he will not give it to food or to trying to be boss of the world or to being a superstar. Instead he will give it to loving God. t The hymns for Jesus’ temptation are not particularly child-friendly. 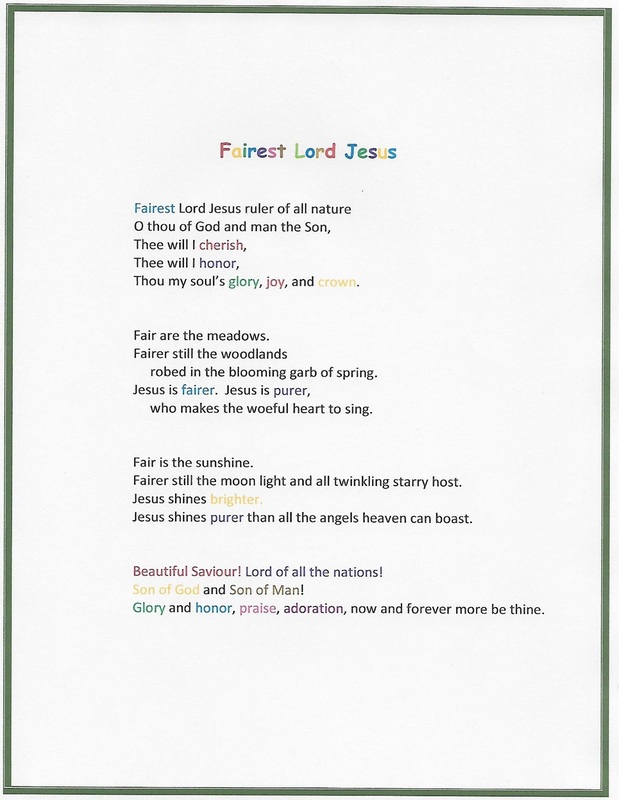 So, start singing your way through Lent with Fairest Lord Jesus. 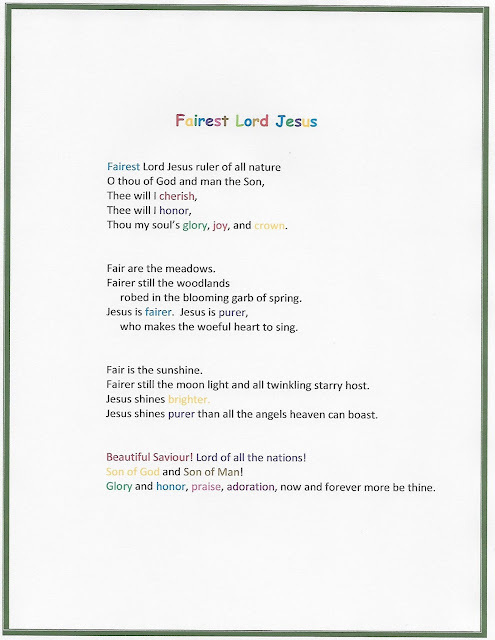 Before singing it point out all the praise words and titles for Jesus that are highlighted on the word sheet. Then invite worshipers to begin Lent by singing them together to praise Jesus. Invite children to draw pictures around the page that illustrate the parts of the world in this song or the parts of the world in the story of Jesus in the wilderness. t Go to Observing Lent and Celebrating Easter in Year A for the following suggestions about exploring the temptation story in worship. t Children instinctively understand what it means to define yourself by the group to which you belong. When meeting someone new children start with their name and age but quickly begin naming the groups to which they belong. The unstated assumption is that if you know which groups I belong to you know who I am. Usually they name sports teams and activity groups in which they participate. The trick is to help them look to larger groups of which they are apart – in this case the people of God. 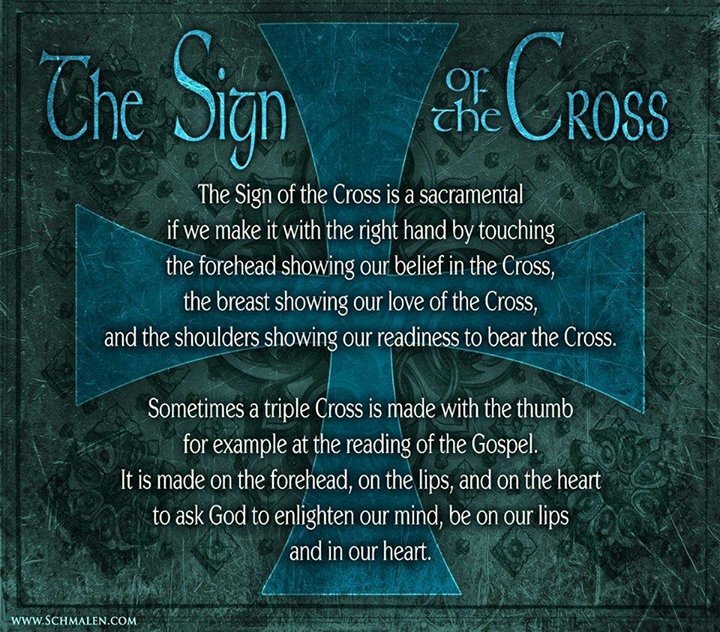 With older children it would be possible to walk through one of the story creeds said often in worship pointing out that we join people who have said the creed for years. 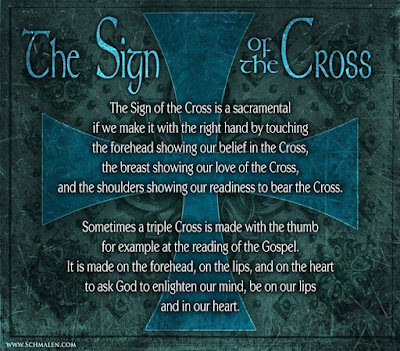 It would also be possible to have one person bring in a basket of fruit to place on the Table reciting the creed from this text followed by a person bringing money to put in the offering basket reciting one of the creeds. Either of these could be interesting to explore with older children. However, I doubt they will get much attention on the first Sunday of Lent. t This psalm is here because it echoes Jesus’ experiences in the wilderness and calls us to trust God as he did. Children will not catch that echo as the psalm is read. It is also filled with unfamiliar words (snare, fowler, pestilence, pinions, buckler, refuge). 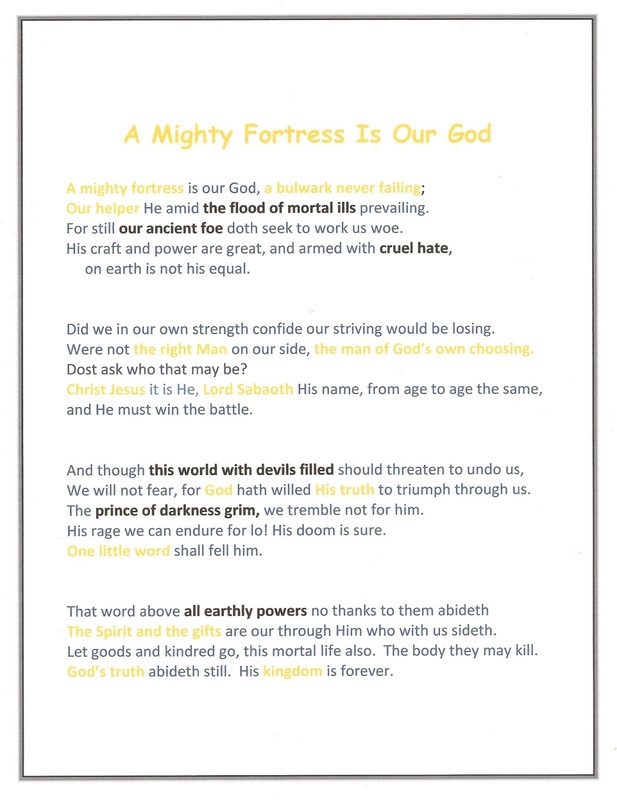 t “A Mighty Fortress is Our God” is based on another psalm (Psalm 46), but carries the message of this psalm and reminds singers of Jesus who conquered temptations. The words are difficult for young readers, but the music communicates brave confidence and most congregations sing it with that feeling. 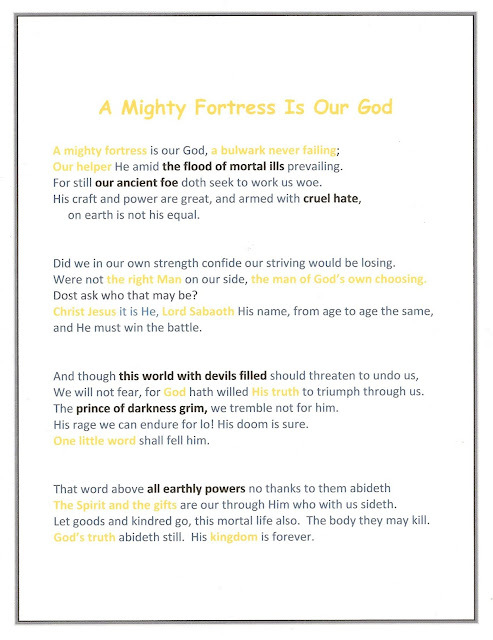 Before singing it, point to the bolded dark words and phrases and the golden ones. Note that just like us Jesus relied on the golden ones to face up to the dark ones AND that Jesus becomes one of the golden ones that help us when we face temptations. t This is a very abstract message that uses lots of words that are hard to define for children – confess, believe, justified, saved. Other texts are more helpful in exploring most of these words. t Dramatize the reading of this story using 3 readers: a Narrator in the pulpit and Jesus in the center with the Devil beside Jesus. If Jesus and the Devil are comfortable with doing so, the Devil can gesture with his hands as he tempts Jesus and Jesus can look on skeptically before responding with words and “no way” hand positions. Devil: If you are the Son of God, command this stone to become a loaf of bread. Devil: To you I will give their glory and all this authority; for it has been given over to me, and I give it to anyone I please. If you, then, will worship me, it will all be yours. Narrator: When the devil had finished every test, he departed from him until an opportune time. t Children and adults appreciate this wonderful cartoon telling of Jesus’ 40 days in the wilderness in their own ways. Find it at http://www.youtube.com/watch?v=P-6a25Yo2wE . It is just over four minutes long. Introduce it by reading the biblical text, then wondering with worshipers what Jesus did during those 40 days. Encourage them to watch thinking about what Jesus was feeling and doing each day. t To most children (and many worshipers) Satan or the Devil is the bad guy. Take time to introduce him as the tester before reading this story in which he tests and actually helps Jesus decide clearly how he will spend his life. To take it further, talk about the picture of a red devil with horns, a tail and a pitchfork. Insist that such pictures are not photographs and that the Devil is actually invisible or can take many forms. Suggest that in this story the Devil might have been more like a voice inside Jesus’ thinking. Compare it with the silent conversations we often hold with ourselves as we try to decide about doing something we know we should not. 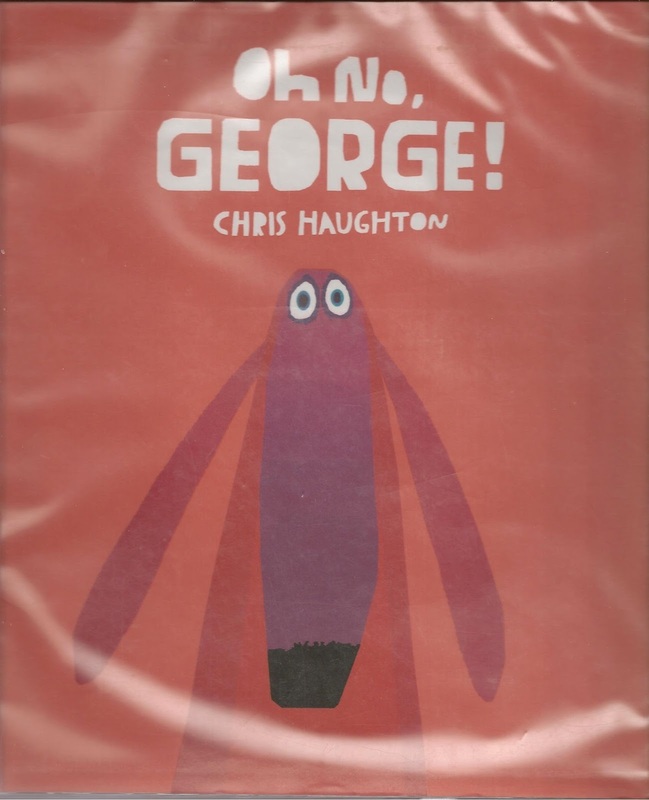 t Oh No, George!, by Chris Haughton, is a picture book with very few words. It begins with Harry leaving his dog George at home telling him to be good. George reminds himself that he wants to be good but when he sees a cake on the counter, the cat, and a planter full of dirt he does everything he should not. Harry is distressed when he comes home to the mess. Later when they go for a walk George sees a cake on a picnic blanket, a cat, and a huge flower bed but resolutely passes by all of them. 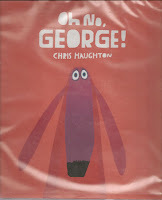 The book ends with George looking at a trash can and thinking how he loves to dig in trash, then looking up in surprise as Harry shouts “George?” It reads in about 3 minutes. Showing the pictures is essential! With 4 – 6 year olds, just read the story. Ask if only dogs want to do things they should not. Make a list of a few things people sometimes want to do and have that they should not. Close with a prayer for God to help us when we want to do things we know we should not. Don’t even mention the word temptation. With 7-10 year olds, read the story and quickly have the same discussion. Then, introduce the word temptation as a big word for all those things we want but should not have or do. The cake, the cat, the dirt, and the trash can were all temptations. Point out “lead us not into temptation” in the Lord’s Prayer noting that every time we pray this prayer we are praying for God to help us walk past the things we should not take or do. 10-12 year olds are ready to do all of the above and to explore the word temptation more fully. Using the story, define “tempted,” “tempting” and finally “temptation.” Have fun making sentences using the three words. Close by putting the “lead us not into temptation, but deliver us from evil” into your own words. t Katie Barrett Todd of Storypath (http://storypath.upsem.edu/lectionary-links-sunday-february-14-2016/) sends us to a fresh theme by sending us to The Nonsense Show, by Eric Carle. It is one of those books that need not be read in its entirety. Instead, look at the cover with a chicken hatching out of a banana peel or the illustration of a rabbit pulling a man from a magician’s top hat on the first page and ask why the words say it is a nonsense show. Then look at several other nonsense drawings, e.g. a bird in an aquarium, a fish in a birdcage, and (my favorite) a big yellow cat with one half covered in leopard spots and the other in tiger stripes. Though the book jacket says it is an introduction to surreal art, it can be used this Sunday to point out the nonsense of trying to be what you are not. Satan tried to tempt Jesus to be what he was not, i.e. a stuntman, a bread provider, or a political king. But, Jesus knew that he was not any of those things. He was the king of love, God’s son. Like Jesus we are called to know who we are and not put on any nonsense shows trying to be who we are not. We are God’s children and Jesus’ disciples. Not putting on any nonsense shows is an especially good challenge for Lent.